We often travel on our own time and own dime. When we receive complimentary products, services, or accommodations as a result of our blogging activities, we will disclose that at the time we write about it. Midwest Guest is a member of ad affiliate programs and networks. If you click through the affiliate links or ads from here and purchase something from one of our affiliate partners, we receive a small commission. This income helps us pay for our blogging expenses and Midwest travel. I've never been that wild about taking trips myself in small planes and trips underground, but this story from Erin about a trip she and her son took to see the Quincy Copper Mine at Copper Harbor in Michigan's Upper Peninsula was pretty fascinating. I do share her son's fascination with geology and rocks, so I may have to re-think my aversion to tiny enclosed spaces. Meanwhile, I can see highlights of Erin's trip and exploration of Quincy. A bonus? The duo stayed at a motel we've stayed at several times in the past, and I loved the shots of their room at the Bella Vista and the beautiful harbor view that I loved seeing. Think I'm due for another trip up there one of these days? 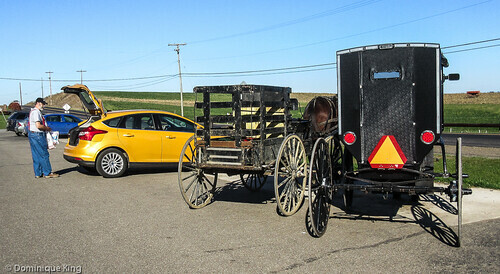 We loved visiting Ohio's Amish Country in the heart of Holmes County. Share Heathers travels through the scenic country side, visits to the area's "Cheese Heaven" (and several cheese places we also visited), plus a glimpse of the hearty comfort food we also enjoyed so much when visiting there ourselves). Check out her story at the Ohio Girl Travels blog. Canal history always fascinates me...probably, at least in part, because we do not have much in the way of canal history here in Michigan. Ronny takes a quick look at the rich history of the Miami-Erie Canal in Ohio. The canal was a major transportation link throughout the state and served to move folks through, and around, Ohio before automobiles, trains or other technological advances made transportation speedier. The canal system in this country played an important part in fueling the westward expansion, but the leisurely place of oxen, horse and mule drawn boats allowed travelers a more leisure look at the passing country side than we enjoy today. Check the story out at the Queen City Discovery blog. 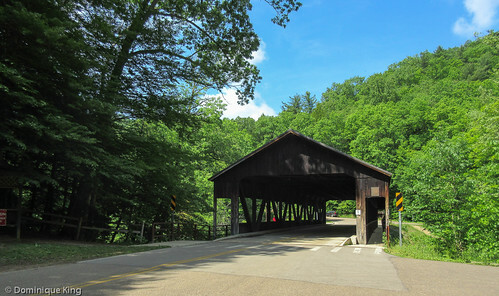 Join Chris on a tour of some of the covered bridges in Parke County Indiana. I've long heard about Parke County and its amazing collection of covered spans. It's on a destination on my Midwest bucket list. Meanwhile, I can enjoy getting a little peek at the area with the images on this article at the Indiana Insider blog. It is impossible not to see many buildings made of lime stone in and around Indiana! Mark offers us a fascinating look at the history and use of this natural Hoosier resource, the shifts in the technology of the limestone industry and some of the iconic buildings of limestone that are around the country. Check out the story at the Indiana Insider blog. Tonya gives us a great list of cool and interesting things so see in Ohio. 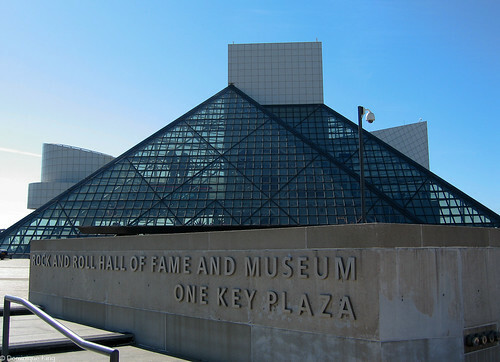 We've seen a few things like The World's Largest Collection of Rock and Roll Memorabilia (at the Rock and Roll Hall of Fame + Museum in Cleveland), The Garfield Memorial (at the Lake Side Cemetery in Cleveland), eaten pizza at a Covered Bridge (North Kingsville) and visited the Tomb of President McKinley (Canton). There are still plenty of things on the list I'd love to see yet myself like the Pencil Sharpener Museum (in Logan) Dave Grohl Alley and the World's Largest Drumsticks (Warren) and the Y-Bridge (Zanesville). Check out this fun list at the Traveling Praters blog. Fans of the "Little House" series of books are well aware of Laura Ingalls Wilder's connection to many Midwestern states and make it a point to visit as many of the places where Laura and her family lived during the late 1800s. Beth takes readers at Midwest Weekends on a quick tour of these sites in places like Wisconsin, Kansas, Minnesota, Iowa and South Dakota where Wilder and her family spent time at one point during their life journey. It's fun to see so many of these sites gathered together in one article. Many classic old bank buildings no longer exist, but Mark profiles one here that still stands in the eastern part of Nebraska along with a couple of other former bank buildings still in the area. This is a fun look at banks and currency through the years in Ashland, Nebraska. Check is out at the Stay on Route 6 blog. I always love visiting state capitol buildings, and found this round up of facts about North Dakota's unusual skyscraper capitol building quite interesting. This is one of only three skyscraper capitol buildings in the U.S., but Connie found out that this style of building has 80 percent usable space versus the usual traditional domed building we're usually used to seeing as a capitol building. Check it out at the Midwest Wanderer blog. It's been a several years since I've visited Hamilton County, which is about 30 miles from Indianapolis, Indiana, so I enjoyed virtually revisiting the area with Francesca and her family. This story spotlights several of the favorite places I saw during our visit there, including the historic Hamilton County courthouse in downtown Noblesville, the lifelike statue of a woman grocery shopping in front of the butcher shop in Carmel (where we originally discovered another Midwest treat--Rickle's Pickles) and Conner Prairie (where we experienced a thought-provoking Underground Railway program). Check out the story at the Working Mom's Travels blog. I've always wanted to visit Galena, Illinois, and this story from Mel show us several noteworthy hikes in the area. I particularly enjoyed seeing images of the pedestrian bridge along the Galena River Trail (I'm a real bridge fan, so this goes on the list of things I need to see in Galena!). Check out the story at the A Little Time and a Keyboard blog. Travel through the beautiful scenic farmland near the Wisconsin Dells and enjoy a little old fashioned history and adventure near Baraboo, Wisconsin. I loved seeing the restored vintage railcars learning a bit more about railroad history in the area. Check out Kenneth's story and great images at the Wisconsin Explorer blog. We've visited this western Michigan and favorites like Schuler Books & Music many times in the past, but I can see that there are several places I've yet to see here according to Jeff's story. Check it out at the Lifelong Michigander. Join Jessie at the Wandering Educators blog for another look at western Michigan as she surveys some of her kid-friendly favorites with sites that include some of my waterfront favorites like Grand Haven, Manistee and the Sleeping Bear Dunes area. This definitely puts me in the mood to do a little more traveling myself! North Dakota Road Trip Day 6: Dickinson to Medora-Check out Connie's latest North Dakota adventures when she visits the Dickinson Museum Center and shared some images of their rocks and minerals exhibit there (I'm a big fan of such exhibits! ), the Ukrainian Cultural Institute and the North Dakota Cowboy Hall of Fame as she heads towards the Theodore Roosevelt National Park. Check it out at the Midwest Wanderer blog. Ten Things You Need to Know About Indianapolis City Culture-Aaron advises readers that you will need a guide to find the "good stuff" in this Hoosier city. Here is his guide to the city and its culture at his self-titled Urbanphile blog. Check out a few of our own blog posts about the city as well! Seeing an Indianapolis Indians baseball game...or not, White River Gardens at the Indianapolis Zoo and Visiting the Eiteljorg Museum in Indianapolis. Mid-Century Modern Design at Miller House and Garden in Columbus-I've wanted to visit Columbus, Indiana and learn more about it's history and place in mid-twentiety-century architecture. Fortunately, Jessica gives us a great look at some of the architectural gems in this mid-American showplace. We see some great images of the Miller house with the work of the Saarinen father-and-son architectural team, which reminds us of some of the work done by the same family here in Michigan, like the buildings they designed at the Cranbrook educational campus in metro Detroit. Check out Jessica's story at her Little Indiana blog. 24 Hours in Detroit-Charity hails from Cleveland, and I've long-enjoyed her I heart <3 Cleveland blog, but I really enjoyed this report about her weekend visit to Detroit! This story includes some info and images of some of the city's great hidden treasures like the Shinola store in midtown Detroit, John King Used and Rare Books Store and the historic Pewabic Pottery shop and design studio. Charity even includes a report about her visit to Toledo's Libbey Glass Outlet. which she checked out on her way into Detroit. See her story here. 4 Great Activities with Kids in Detroit-Mr. In A Cents offers a great list of family-friendly fun and activities in the Detroit area! We're members of the Detroit Zoo and The Henry Ford, so they're already a couple of my favorite sites around the city, and I enjoyed the images from the newly re-done Penguin Center and the classic Oscar Weinernobile at the Henry Ford. Plus there are a few great images here of two places I've been longing to see in person myself-Marvin's Marvelous Mechanical Museum and the Outdoor Adventure Center near the Detroit River. Check it all out at the InACents travel blog! The Stars Still Shine at Detroit's Redford Theater-Jeff writes about his family's visit to another family-friendly spot in Metro Detroit, the classic Redford Theater. We remember seeing the movie, A Christmas Story, here a few years ago. We loved the drama of seeing the huge theater organ rising out of the stage and the classic 1920s Oriental-themed decor. Check it out at the Lifelong Michigander blog! 2017 Motorcycle Trips-Join Heather as she and her husband start planning their spring and summer...and check out some of her great suggestions for Midwest motorcycle adventures. Their trip list looks a lot like something Tim would put together! We look forward to hearing about the couple's trips this spring and summer. Check it out at the Ohio Girl Travels blog. Stadium Seats and Stories from the Gardens-Here are a few memories of the venue seats and stories of the arenas where Ronny watched events like minor-league hockey games, women's roller hockey, the circus and monster trucks! Check it out at the Queen City Discovery blog. The 7 Indiana Ballparks That Baseball Fans Must See-We love catching a sports event when we travel. There isn't a better way to get a real feel for the history and culture of a place and spend a fun time with locals! Check out this Visit Indiana blog post about some of Indiana's notable ball fields, including Victory Field where we saw the Indianapolis Indians play and Parkview Field where we saw Fort Wayne's beloved Tin Caps play. Check it out at the Visit Indiana blog. 10 Ways Marietta. Ohio is So Much More than it's Tomatoes-Tomatoes? Who knew? Well I love good ripe tomatoes, but Kayrn tells readers there is a lot more to do in the southern Ohio city, even once its legendary tomatoes are gone for the season. Kayrn shares historic sites, an architecturally beautiful basilica (which reminds me of the one we saw in South Bend, Indiana) and quirky sites like the Mortuary Museum, which sounds like somewhere I would need to go when I visit Marietta! Check it out at the Sand and Snow...and Everywhere in Between blog! Urban Kayaking on the Mississippi River in Minneapolis-Jenna and Micah take readers on an urban kayaking adventure to celebrate the arrival of spring in Minneapolis. Seeing a major city from the river always gives you a fresh perspective, even if you have lived in the city for a long time! Check the story of their trip with a batch of fellow travel bloggers at the Wander the Map blog. P.S. Looking for more great photos? Here are a couple of photo books that we recently ordered from Amazon and really enjoyed...one from Ohio and another from the annual Wildlife Photographer of the year exhibit that I recently saw at the Detroit Zoo. As I see more and more stories about Black Friday, Cyber Monday and shopping until I drop, I'd love to remind folks to make the extra effort to support their Midwestern neighbors and their businesses by shopping locally and buying local products and services. I asked some fellow Midwestern travel bloggers for some suggestions, and here are some fun ideas for creating a real Midwestern holiday as you shop for your loved ones...or just if you want to grab a little something for yourself this holiday season! Exploration of The Wildbird Shack in Mt. Prospect Reveals Locally Made Items and Sense of Community-Mel urges readers of the A Little Time and a Keyboard blog to check out a cute local store in the Chicago area as they shop for seeds and other supplies and help their local avian friends weather the winter. Even as the temperatures plunge, The Wildbird Shack is a warm and welcoming place, as well as a community center for bird lovers that highlights local product and the store's own special blends of seed and other feed. Anderson's Candy Shop (Barrington)-Working up an appetite while feeding your feathered friends? Mel says to stop by this local candy company in suburban Chicago and get a treat for yourself! Anderson's is a three-generation family business with gorgeous house-made chocolate treats in more than 30 different flavors with creamy, crunchy, chewy centers and more. Mel particularly Anderson's chocolate-dipped ginger bars and tells us that the Barrington store also participates in the town's Wine Walk events. Made in CBUS-The Experience Columbus Web site devotes a lot of space to highlighting local dining, attractions and shopping for folks heading to Ohio's capital city for a few days. The city takes a special pride in their local businesses that include independent restaurants and locally owned boutiques, many of which offer locally made product created by Columbus artisans, craftspeople and designers. Columbus is #3 on a list of Fashionable Destinations from USA Today, and recent ranked as top Midwest Destination for visitors. Columbus has a number of special shopping districts in town like Short North Arts District and German Village, and these are just a few things you can learn more about at Experience Columbus. Motor City Brew Tours-If you're a beer drinker and live near Detroit as I do, you know that the Motor City has a wealth of great local brews! Aimee West tells us that Motor City Beer Tours put together a package that includes a gift certificate, a Detroit Beer Book (why have I yet to see this one?) and a few other tools like a can koozie and coaster to help you experience your tasting tour knowledgeably and in style! Holen One Farms and Preferred Popcorn from Nebraska-Check out Gretchen's story at the Odyssey Through Nebraska blog to find out about a couple of companies owned by Nebraskans who create and package local food products to sell at fairs (like the State Fair where Gretchen discovered them) and other outlets. Holen One Farms offer a range of grilling products like marinades, dipping sauces and seasoning rubs to help you put a little zip into your meals (Gretchen and her family like their Java Rib and Roast Rub). Gretchen also discovered some zippy microwavable jalapeno popcorn from Nebraska's Preferred Popcorn, which is a company run by several Nebraskan farm families. Holiday Adventures with Adventure Santa-Cindy shares a story about a couple in Minnesota who created a toy and book combo to help share holiday adventures with the jolly holiday fellow and your children while spending time together! Baking cookies? Cutting down your own Christmas tree? Or creating a new holiday tradition with your family? This is a fun way to get your children involved and using their own imaginations to help create holiday happiness! Check it out at Traveling Adventures of a Farm Girl. More ideas about regional holiday products, services other things Made in the Midwest? Share them here or let me know as I'll continue to share more ideas this month about how you can support local sites and businesses as you complete your holiday shopping! How to Survive a Winter Beach-I've never really looked at a winter visit to a beach as matter of survival, but more often as a serene opportunity to enjoy the landscape without dealing with hordes of people and noise you so often find at the beach in the summertime. Check out Brianna's story about enjoying visiting Michigan beaches during the winter at the Wandering Educators blog. Spend a Sunday Afternoon at Oberlin's Frank Lloyd Wright House-A history professor wondered if she would enjoy living in a "beautiful work of art" as she contemplated purchasing a house designed by famed architect Frank Lloyd Wright in 1968. Ellen Johnson eventually decided to purchase the house in Oberlin, Ohio and found living in it a very serene experience. Read Betsy's story about it at beesfirstappearance blog and see many images of the home that now serves as a guest house and special event space for Oberlin College. What's in a Name: Petoskey Stone Edition-Farland shares some words written by Rose Petoskey about Michigan's state stone, the significance of its name in the Odawa language of Native peoples and the history of the fossilized coral. Check out the story at the Michigan in Pictures blog. Biking to the Mississippi Headwaters at Itasca State Park-Jenna and Micah take readers to the oldest State Park in Minnesota to explore where the Mississippi River originates and begins it long journey to the Gulf of Mexico. Check out their story about riding the bike trails in the park at their Wander the Map blog. Split Rock Lighthouse, Lake Superior's North Shore, Minnesota-I was happy to see this blog from Amy Rea about one of my favorite Great Lakes lights, Minnesota's scenic Split Rock Lighthouse on Lake Superior. The iconic light sits on a cliff high above the lake's shore, making the climb down to see it a bit on the challenging side, but the views are definitely worth it! Check out the story at the Wandering Educators blog. Also be sure the check out Amazon for books by Amy like Camping Minnesota: A Comprehensive Guide to Public Tent and RV Campgrounds, Explorer's Guide to Minnesota, Land of 10,000 Lakes and more! Webster City: Exploring Rural Life-Day1-Connie explores the rural area around Webster City in Iowa and learns about how much anyone considering a career in modern agriculture should study and learn in order to make a success of it. Check out the cool images of farm equipment at a local John Deere dealership and more at the Midwest Wanderer blog. Wandering with our T&B Trailer to Sleeping Bear Dunes area of Michigan-We've traveled to Michigan's Sleeping Bear Dunes area numerous times over the years, but I especially liked seeing this area from the point of view of folks traveling in a small, tear-shaped camper trailer. We've visited the campground as we've done the trip down the lower Platte River via canoe and used area at the park to end our trip at the beach along Lake Michigan...plus Fishtown at Leland is a favorite stop for us when visiting the area. Check out Joe's post at his My Quality Time blog. A Taste of Marquette-Join Jeff for a quick trip to see some highlights in northern Michigan's Marquette. Home to the Upper Peninsula's largest university (Northern Michigan University), it is the U.P. 's largest city at 21,000 residents, so there is plenty to see (like a lighthouse), do and eat in the city. Check it out at the Lifelong Michigander blog. 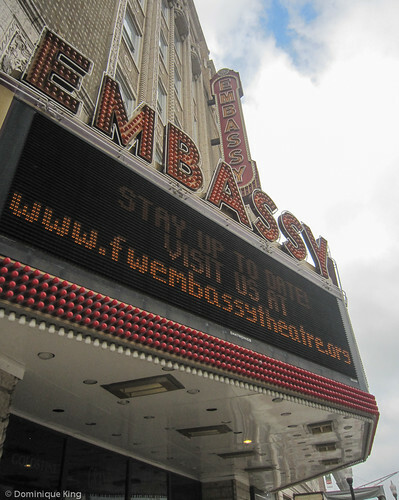 5 Architectural Gems that will Catch your Eye in Fort Wayne, Indiana-The historic Embassy Theater caught Tonya's eye when she visited this northern Indiana city, just as it caught mine during a drive through town several years ago. I enjoyed seeing images of the theater and other Fort Wayne landmarks that we enjoyed visiting ourselves. Check it out at the Traveling Praters blog. Weekend Fun in Fort Wayne, Indiana-Connie also shared a few of the highlights of her own trip to Fort Wayne and visited many of the places we enjoyed in the city like the Foellinger-Freimann Botanical Conservatory, the Genealogy Center at the library and seeing baseball's must-see Tin Caps! Check it out at the Midwest Wanderer blog. Meanwhile, I always like to hear about any other favorite Midwest stories or blogs you think I might like to check out! Want more Midwest news and links? Subscribe to my bi-monthly Midwest Guest newsletter! Hara Arena-It's the end of summer when my thoughts definitely turn to hockey, so I enjoyed this story about a sad good-bye to a classic hockey barn just outside of Dayton, Ohio. I definitely see the point Ronny makes here about how minor league sports teams might be best off with smaller venues instead of larger and more modern venues that attempt to ape the modern major-league venues. Besides, any article that mentions the classic "Slap Shot" flick with Paul Newman definitely got my attention! Check it out at Queen City Discovery. Made in Marietta: Bite-size History at Semah Studios-Images of historical plaques dot the pages of my own blog when I use them to illustrate stories and give readers a little background about historical sites we visit as we travel. Check out Tonya's story about this Ohio business that produces many of these plaques for sites around the country it at The Traveling Praters blog. Behind the Scenes of Wisconsin Supper Clubs: Another Round-Supper clubs with hometown hospitality and homemade food are a tasty tradition in Wisconsin. Jessie looks at these family-run eateries and interviews author Rob Faiola about his book, Wisconsin Supper Clubs: Another Round. The book is a follow up to Rob's first book about dining clubs, Wisconsin Supper Clubs: An Old-Fashioned Experience. What I want to know is if any of them serve whitefish livers?! Check it out at the Wandering Educators blog. Exploring the Southern Minnesota Children's Museum-Road construction and a child's upset stomach led Shanna to question if the hassle was worth the trip to this children's museum, but the trip happily ended well as Shanna and her family found plenty to keep them engaged for several hours at this museum near Mankato, Minnesota. Check out the story at A Midwest Travel Companion. Road Trip Through Northeast Minnesota-Join Jenna and Micah as they join fellow travel bloggers to tour northern Minnesota between Duluth and Grand Marais along the Lake Superior shore. We remember enjoying traveling in this area and loved re-visiting some favorite sites like Canal Park area and Aerial Lift Bridge in Duluth, the Split Rock Lighthouse and much more! Check out Jenna's story at Wander the Map. Graveyard of the Great Lakes-The eastern end of Lake Superior above Michigan's Upper Peninsula has a long reputation for claiming ships and lives in the area known as the Shipwreck Coast. Despite the doomsday title of this story, advances in technology and navigation improved sailing safety and tourists flock to the scenic area each summer to see the lighthouses and the Shipwreck Museum. Check out Beth's story at Midwest Weekends. Lighthouses of the Apostles-Visiting the Apostle Islands was another favorite trip of ours. The sunset boat cruise where we toured the lighthouses out of Bayfield, Wisconsin was particularly memorable. Check out Beth's story about the area and its lighthouses at Midwest Weekends. Best Motorcycle Routes: The Scenic Windy 9-Check out a collection of motorcycle routes developed by the Athens County Convention and Visitors Bureau in southern Ohio. Heather shows highlights of the Windy 9 and includes a short video of the trip with her story. I know Tim would love to try some of these routes! Check it out the story at the Ohio Girl Travels blog. North Dakota Road Trip Day 2: Valley City to Devil's Lake-Here is another in a series of stories Connie wrote about exploring North Dakota. 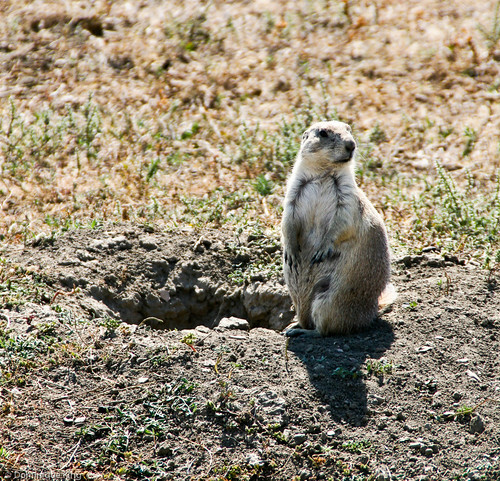 She takes us on a road trip that includes a tour of the Ronald Reagan Minuteman Missile Site, a quick peek at the big buffalo at Jamestown (we spotted this guy on the way through North Dakota ourselves) and a look at a game nature preserve where she lingered for a while watching the prairie dog town (much as we did at the Teddy Roosevelt National Park in the state). Check it out at Midwest Wanderer. The World's Largest Gavel-Tonya sees the World's Largest Gavel in Columbus, Ohio. This quirky roadside attraction is a stainless steel sculpture in the city's downtown and in front of the Judicial Center. Check it out in The Traveling Praters blog. Stan Hywet Hall and Gardens-Mike found the perfect tour in Akron, Ohio that allowed him to bring his best friend to tour a beautiful home and with him! Mike's Chihuahua buddy Slider look like they enjoyed this "woof walk" around the grounds and gardens at the Akron mansion of a founding family of the Goodyear Tire and Rubber Company. The National Historic Landmark offers tours that include special Sunday times when you can tour the home with your leashed dogs. Check it out at OHventures. Exploring World's Only Quilt Gardens Tour-Join Connie for a tour of some beautiful "quilt gardens" in northern Indiana. These self-guided tours look are bigger and better organized since I remember seeing them several years ago! Check it out at Midwest Wanderer. For a Few Hours, a Fading Advertisement Returned to Prominence-Ever notice "ghost" signs in your city? Ronny has a special interest in these fading artifacts--in fact he wrote a book on the subject-Fading Ads of Cincinnati by Ronny Salerno. Check out the story at Queen City Discovery about a visual artist's visit to spotlight one of the Cincy ghost signs pictured in Ronny's book. I loved this behind the scenes look at the process of bringing these signs back to life...if only for a day. And, yes, there are plenty more ghost signs pictured in Ronny's book. That's it for this month's Midwest travel links list. Do you have any favorite Midwest stories or blogs to share? 20 great spring drives-I love Beth's round up of scenic drives throughout the Midwest. I have fond memories of traveling along the North Shore of Minnesota, where we visited Gooseberry Falls many years ago, and the Illinois section of the Lincoln Highway, where we managed to get as far as Joliet a few years ago during some heavy construction. 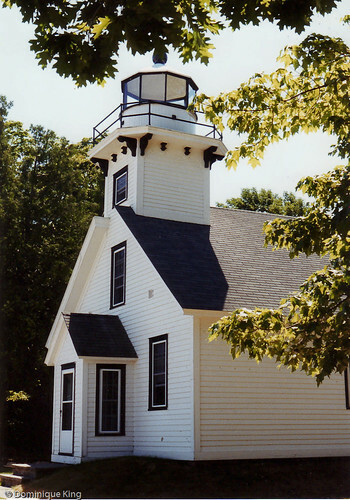 The list concludes with the suggestion of traveling through northwestern Michigan with a stop at the Mission Point Lighthouse, a stop we've made many times ourselves. Check it out at the Midwest Weekends blog. A Little Swedish Utopia on the Illinois Prairie-Scandinavian immigrants have a rich history and presence in parts of the Midwest like the Swedish enclave of Bishop Hill, which is about 150 miles southwest of Chicago. Terri finds plenty of great food, learns about the history and culture of the Swedes and enjoys some quality time with Pippi Longstocking! Check out her story on the Off the Beaten Page blog. 20 years of Pasty Central and the Pasty Cam-We're lucky enough to have a great, and pretty authentic, pasty place a couple of miles from our home in metro Detroit (Barb's in Clawson). If you want to learn more about these hearty meat-and-vegetable pies that are pretty much the official food of Michigan's Upper Peninsula, check out this story by Farlane at the Michigan in Pictures blog and see some of the UP miners who helped popularize pasties here in Michigan. 30 Things to do in Columbus, Ohio-We've driven through Columbus several times, but we've definitely missed a lot by not making time to visit Columbus itself! I think touring the Ohio state capitol and stopping by to see the manatees at the Columbus Zoo or, if its hockey season, taking in a Blue Jackets game to see if any players I remember from our old Plymouth Whalers days (like Jared Boll or Sonny Milano) take the ice for Columbus would be fun. Read Karyn's story at the Sand and Snow blog. 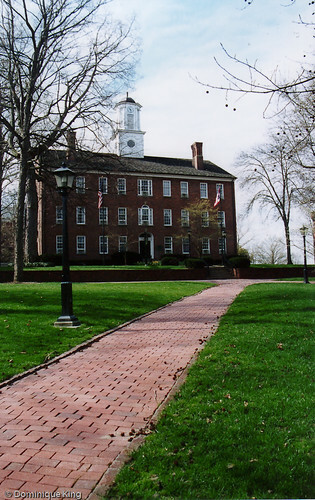 Weekend Getaway Guide: Athens, Ohio-We loved visiting Athens, home to Ohio University. The college campus isn't far from the Hocking Hills area, and it's a beautiful place to visit as a photographer. Ohio history, early 1800s architecture, a thriving foodie scene and more...what's not to like? Check out Heather's story at the Ohio Girl Travels blog. Detroit Agate: Auto Factory Paints Accidentally-People who me well, know about my affection for wearing jewelry made of unusual "rocks". Check out this story of an especially intriguing variety of Detroit "rocks"-Fordite! I've wanted a necklace made from a piece of Fordite for ages (Tim-yes, that's a hint for Christmas). Meanwhile, check out this Urbanist-authored story about Fordite at the Web Urbanist blog. Why you don't want to miss an Early Morning Walk at Maumee Bay State Park-I enjoy walking the boardwalk trail at Maumee Bay State Park. 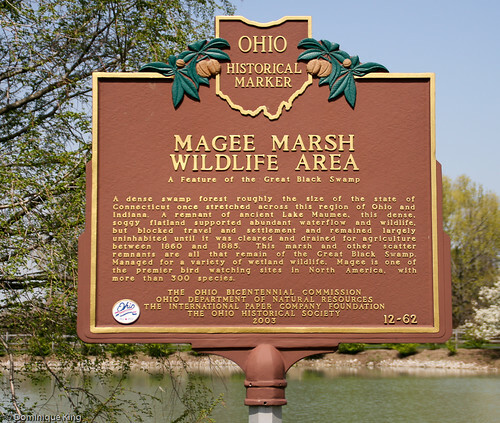 The easy terrain along the two-mile trail is accessible and a great way to see the meadows, swamp and marshes at this Toledo-area nature center while viewing the birds, deer, butterflies and other wildlife along Lake Erie. Check out Tonya's story about this trail at The Traveling Praters blog. 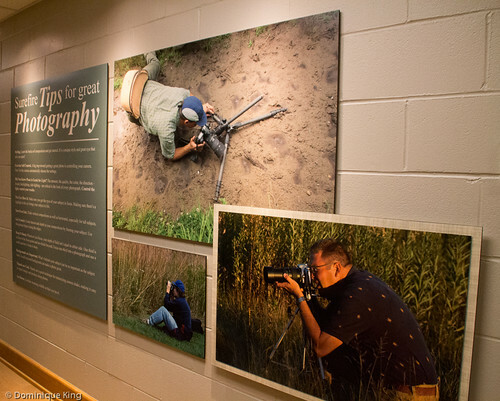 National Center for Nature Photography at Secor Metropark-We loved visiting the National Center for Nature Photography at Toledo Ohio's Metropark when it reopened after a lengthy closure for renovation a couple of years ago. The center has plenty of rotating exhibitions and displays images that continue to inspire others and educate aspiring nature photographers. Check out Bob's story about the center and its current exhibits at the TrekOhio blog. Top 15 Best Architects in Detroit History-Detroit's architectural wonders never cease to amaze me, and it's great to see so many of my favorite Detroit architectural gems in Dale's round-up story at the I Love Detroit Michigan blog. Check out this article to learn more about architects Albert Kahn, C. Howard Crane, Eliel & Eero Saarinen, Minoru Yamasaki, Louis Kamper and others beloved by fans of classic Detroit architectural history. On Magee Marsh's Famous Boardwalk, I Spotted Warblers, Blackbirds and Kenn Kaufman-We've enjoyed visiting Magee Marsh multiple times ourselves. Check out Betsy's report on this northern Ohio wildlife refuge and this year's Biggest Week in American Birding activities at her beesfirstappearance blog. 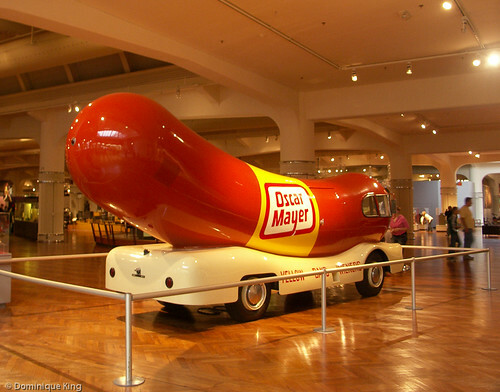 Quirky Attraction: The Indianapolis 500 Museum-Regular readers of Midwest Guest know that we love visiting car museums, so I loved seeing Scott's story about the Indianapolis Motor Speedway Museum. We went to an Indy 500 race many years ago, and I have memories of the parades, venturing into the crush of the infield and the streaks of color zooming by as cars circled around the track, but the museum looks like a great place to more fully appreciate the history of the iconic race and cars through the years. Check out the story at The Quirky Travel Guy's blog. One of the best Places to Visit in Minnesota for Savoring Gourmet Cheese-Shanna takes readers to The Cheese Cave in Faribault, Minnesota. Sandstone caves under the hills near his southern Minnesota city started out by housing beer and barley for a German beer making business starting during the 1850s before Prohibition put a stop to that operation in 1919. Subsequent owners repurposed the caves as a place to age cheese. Check out Shanna's story about it at A Midwest Travel Companion blog. Be sure to also check out Shanna's recent guest post at Midwest Guest about some of her favorite places to visit, shop and eat in Grand Marais on Minnesota's north shore along Lake Superior! Tuesday Trivia: New Navy Pier Ferris Wheel Statistics-Chicago's new Centennial Wheel debuted last month. I remember the outsized Ferris wheel being pretty impressive when we saw it more than half-dozen years ago, but the new Centennial Wheel looks even more impressive these days if the list of stats I saw for it is any indication. Check out the story about it at the Chicago Architecture blog. 8 Ways to Celebrate Vernors' 150th Birthday-Vernors is an iconic and uniquely memorable Detroit ginger ale. This snappy yet sweet soft drink is definitely one of our favorites! 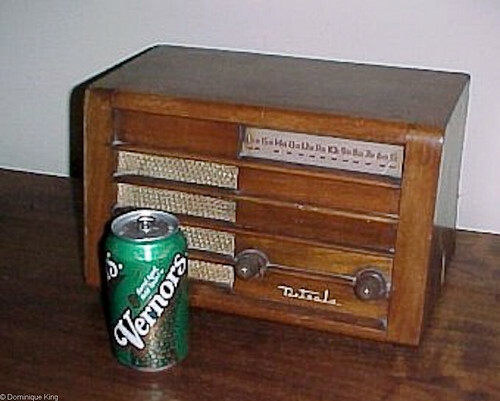 Vernors is the oldest continuously produced soda pop in the country...isn't it time to give it a try? Check out Heidi's story at the Experiences in the D, Visit Detroit's blog. I'm pretty fond of an ice-cold Vernors simply on the rocks, but I admit having a special place in my heart for Boston Coolers (a Vernors-and-vanilla-ice-cream drink!). It's been years since we've visited the north shore of Lake Superior and enjoyed a drive along the scenic Minnesota's Highway 61. I loved reading Shana Schultz's account of her visit to Grand Marais (and our apparent mutual love for Ben Franklin stores) and remembering what we've been missing. Thanks, Shana, for sharing your story with Midwest Guest readers! For many, the north shore of Lake Superior is the iconic image that comes to mind when they think of Minnesota (other than a snowy wasteland); rugged cliffs overlooking blue water surrounded by unending expanses of forest. Grand Marais is an ideal place to experience Minnesota's beautiful natural wilderness and a huge heaping helping of the famous "Minnesota Nice". If the weather is nice, a hike out on Artist's point will is a good place to start your explorations. Once you have finished the short hike around the point, you can walk out on the breakwater towards the lighthouse to get a different perspective and some great photos of the city. Back in town, there are a number of essential stops and icons no new visitor to Grand Marais should miss. The Lake Superior Trading post should be next on your Grand Marais bucket list. The trading post sells sporting equipment as well as a great selection of Minnesota made gifts. I have fond memories of the maple syrup candy from visiting as a child (and I still make sure to pick some up whenever I am in the area). If you are keen to experience a nostalgic piece of history that has been in operation on the Grand Marais main drag for more than 70 years, head to the Grand Marais Ben Franklin. One could easily get lost perusing unending aisles of this and that. There are a couple of can't miss food experiences to be had in Grand Marais. For those with a sweet tooth, a stop at World's Best Doughnut's will satisfy even the most pervasive of cravings! Fans claim their cake doughnuts are the best in the world, but you should also not miss their filled doughnuts. Sven and Ole's Pizza is a kitschy, bumper sticker worthy destination right in the heart of Grand Marais (I have seen the iconic Sven and Ole's bumper stickers on the other side of the country and even the world!) The pizza is pretty good, too. A great, casual choice for dining in Grand Marais is the Angry Trout Cafe, a great restaurant that focuses on locally sourced and organic food. This is a satisfying place to get locally caught lake trout as well as other yummy, homemade fare. Bluefin Bay Resort is just down the road from Grand Marais. It offers a wide variety of room choices to accommodate any size of family (including suites) as well as children's activities, beach barbecues and bonfires on the beach complete with s'mores! Grand Marais is an easy stop for a day or weekend trip, as everything in town is relatively close and easy to access (though you will still likely need a car to get in and to explore outside of town). Many of the sites that I have listed are within walking distance of each other. Grand Marais is a 4 and a half hour drive north from the Twin Cities. The closest major airport to Grand Marais is in Duluth, MN. If you rent a car in Duluth, Grand Marais is a two hour drive up the North Shore. The drive up the shore on Highway 61 is one of the most scenic stretches of road in the country and is a must-see. One could spend a pleasant day (or two!) just meandering up the shore, taking photos and enjoying the views. A visit to Grand Marais offers a great mixture of outdoor scenery, recreational opportunities, kitschy shopping and dining and small town charm! Shanna Schultz is the chief button pusher and muse at Midwest Travel Companion, a travel blog that gives you ideas for Midwest travel with a healthy dose of Minnesota Nice. She also offers travel suggestions for destinations worldwide at There and Back Again Travel. She lives in Minnesota with two tornadoes (um, kids) and a husband and looks forward to upcoming travel adventures both around the block and around the world. Text courtesy of, and copyright by, Shana Schultz. Photos courtesy of Visit Cook County Minnesota. Sixth Street Bridge in Grand Rapids-This post by Farlane at Michigan in Pictures spotlights the 544-foot-long wrought iron bridge built in 1886 by the Massillon Bridge Company of Massillon Ohio and reminds me of bridges with similar histories in Michigan (wrought-iron spans built by Ohio bridge builders during the 19th century) and not to be confused with Grand Rapids' landmark Blue Bridge. Check out the excellent article at the Historicbridges.org site cited by this post for a more complete history of the Sixth Street span. You can also check out Historic Highway Bridges of Michigan by Charles K. Hyde (who taught several classes I had at Wayne State University in Detroit). Flying Hot Dog at Rock and Roll Hall of Fame-We've seen this flying hot dog multiple times at the R&RHOF+Museum in Cleveland, Ohio, but we've yet to be able to make an image of it to share with Midwest Guest readers, so here's a nice shot of it by Karyn at Sand and Snow...and everywhere in between! We first got a membership here when the museum opened in 1995, but we haven't been able to visit in recent years since the museum lifted its prohibition on visitors being able to document their trips with their own images. Returning and making my own images there is definitely on my Midwest Bucket list! Celebrate Indiana's Special Sites during National Parks Week-Kayleen gives readers of the Indiana Insider blog a nice round-up of the three National Park Service sites in the Hoosier State. This year sounds like the perfect time to visit as the NPS celebrates its 100th anniversary and Indiana also celebrates its 200th year as a state! Check out Indiana at 200: A Celebration of the Hoosier State to learn more about Indiana's Bicentennial. 6 Reasons You Need to Go the Detroit This Year-Jessica writes about how Detroit's story of doom and gloom is slowly changing to a story of "comeback" in recent years. While those of us who live in the area are well aware of its problems and its new-found charms among hipsters who pride themselves on discovering places before their widespread popularity among mainstream travelers, here's a list of Motor City highlights. Check it out at the Viator Travel Blog. 101 Things to See and Do for $10 & Under in the Kenosha, WI Area (Part 1 of 4)-I bookmarked this site as we were planning a visit to Kenosha this summer, and some of Tony's suggestions like taking in a Kenosha Kingfish baseball game and climbing the Southport Lighthouse were high on our to-do list! While it doesn't look like this trip will happen for us this year, I'm still keeping this list for future reference. Check it out at The Walking Traveler blog. 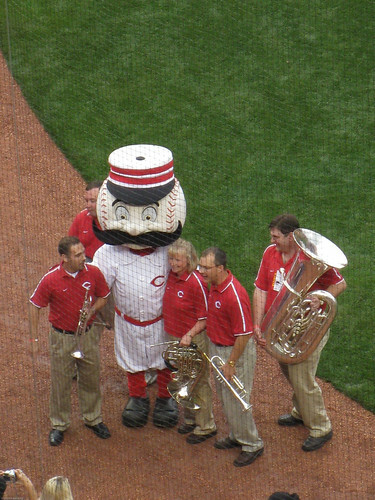 Family Focused, Center City Activities Abound with the Return of Baseball Season-There is much to do in Cincinnati, Ohio, whether or not the Reds make a playoff run according to Randy at the UrbanCincy blog. Check out this video focusing on family fun in the Queen City, which reminded me a bit of some of the things we saw during our own trip to Cincy and a Reds game (you can link to the video here if it doesn't automatically pop up at the blog). Also be sure to check out a recent guest post from Jessie here about Cincy's Findlay Market. What Happened to the Minneapolis Music Scene?-Aaron Renn (a.k.a. The Urbanophile) posts his ponderings about the Minneapolis music scene in the wake of Prince's untimely death this past month. Aaron muses about the importance of the city's music scene and wonders about the fading of its wider impact over the years since Prince's 1980s heyday--as opposed to the music scene in a place like Detroit, which seems to continually reinvent its musical culture in a variety of ways while remaining relevant to a wider audience today. Check it out at Aaron's self-named blog (that I first discovered as The Urbanophile blog a handful of years ago. Wright in Racine-The grandson of the global manufacturer SC Johnson hired an architect during the 1930s to design the company headquarters in southeast Wisconsin with the instructions "don't make it too unconventional". The architect? Frank Lloyd Wright. And the building? Well, Wright certainly seemed to allow his imagination to fly with a structure featuring concrete flying saucer forms and a roof of glass tubing that still attracts many tourists today to tour the futuristic building as part of a cross-state tour of various buildings designed by Wright. Yup, this place is definitely on my Midwest Bucket List. Check out Beth's post at the Midwest Weekends blog. Seward Johnson Sculptures in Crown Point Portray Real Life-Connie did a double take when she realized that a pair of men she saw on a city street in Crown Point, Indiana were actually sculptures and part of a public art project in the northern Indiana city. This summer saw a new public art installation of the realistic sculptures by artist Seward Johnson at Crown Point, and Connie files this report about it at the Midwest Wanderer blog, which includes a couple of familiar looking figures like the ones I saw four summers ago at a similar display in Carmel near Indianapolis, Indiana! Also be sure to check out Connie's recent guest post at Midwest Guest about Cantigny Park in Wheaton, Illinois. Harley-Davidson Museum: Exploring and American Icon-Here's a site Tim and I hoped to get to this year. That may take a while for us, but fortunately we can take a virtual trip with Connie now. Check out her tale about her first time atop a Harley in the drivers' seat as she shares her story about visiting this shrine to the history of Harley-Davidsons. Lots of cool rides here! Check it out at the Midwest Wanderer blog. North Country Trail in Wisconsin-Want a less speedy mode of travel, yet still be able to see some of the most scenic landscape in Wisconsin? Check out the North Country National Scenic Trail as the route meanders through parks and forests, past lakes, rivers and waterfalls, and past a number of other scenic points of interest. Check out Kenneth's helpful guide to hiking the trail on the Wisconsin Explorer blog, complete with helpful hints like where to camp and distances between a number of points along the trail as it runs between the Michigan and Minnesota borders. Mohican State Park in Winter-We loved visiting Ohio's Mohican State Park during the summer, but it looks like there is plenty to do and explore in the park during the colder months as well. Join Deb and Bob as they take us on a tour of the snowy landscape at Mohican. Check out their report at the TrekOhio.Com blog. Know Nebraska: Lincoln Highway North Platte to Wood River-Muriel's Road Trip along the Nebraska section of the Lincoln Highway continues in this edition of the Nebraska Outback blog. Here story includes lots of images of vintage architecture along the route that include historic homes, ghost signs remaining on former service stations, taverns and other business buildings, as well as barns, bridges and other iconic sites along the way. National Women's History Month: Midwesterners make their mark-Check out this story about several notable Midwestern women in this story from The Walking Tourists. I've read a bit about famed aviatrix Amelia Earhart and author Willa Cather, but I particularly enjoyed reading about Mildred Brown in this story. I was not as familiar with Brown, who owned the Omaha Star newspaper with her husband. She assumed sole ownership of the newspaper after the couple's divorce and folks believe that Brown became the longest-serving owner of an African-American weekly newspaper in the United States by the time of her death in 1989. Fort Wayne's Embassy Theatre Unveils New Features-The Embassy Theatre immediately caught my eye when we first traveled through this northern Indiana town, and we were thrilled when reps from Visit Fort Wayne arranged for us to tour the classic 1928 theater and learn about its storied history. Check out Kayleen's report on the theater's most recent renovation and restoration at the Indiana Insider blog. 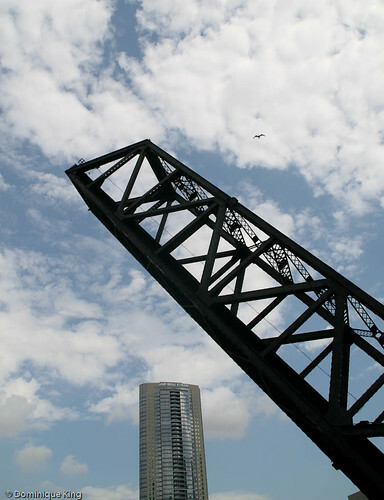 A Day in Arch City-Ronny Salerno is not a fan of the term "flyover city" and takes readers along as he takes a closer look at Columbus, Ohio. Salerno's eye for detail and always excellent images makes the most of his quick trip to Columbus to catch up with a childhood friend. Check it out at the Queen City Discovery blog. Leave your passport at home and visit Dublin, Ohio-Join Karyn as she visits Dublin on a recent sunny St. Patrick's Day to celebrate all that is Irish in this Ohio town. Discover what it is to become Irish for a day in Dublin at Karyn's Sand and Snow...and everywhere in between blog. How Many 100-Year-Old Bridges Are There in Chicago?-Patrick attempts to answer this question on the Chicago Architecture blog. There are four Chicago spans seeing their 100th anniversary this year in the city, including four that still serve as working drawbridges, according to this story. I'm not sure if Patrick manages to names all of the bridges that are 100-plus years old in Chicago, but this list and the accompanying images are well worth checking out! Testicle Festival: Deerfield, Michigan-Everyone seems to celebrate St. Patrick's Day whether they are Irish or not, but how about a lesser known celebration? Kristian Campana usually writes about festivals and celebrations in Ohio, but I noticed that he recently ventured into Michigan to visit the Testicle Festival! Check it out at the OhioFestivals.net blog. Ephemeral City: Election Day Sign-As crazily as this year's election season seems to be shaping up, today's heated debates, contentious campaign rallies and argumentative sniping between candidates don't seem to compare in terms of violence as the 1934 election season in Kansas City, Missouri. Check out John's story about this notorious election that certainly seemed to generate far more heat than light (and inspired Kansas City, a movie directed by Robert Altman in 1996) at the Paris of the Plains blog. Remembering the Michigan Blizzard of 1978-I laugh every time I hear someone complain about what seems to amount to me to be not much more than a dusting of snow. It's no joke when I say that I can expect a blizzard here on my birthday, because I actually remember one of Michigan's most severe blizzards. It happened in 1978, and you can check out Farlane's Michigan in Pictures blog (make sure you watch the video!). Bishop Baraga, R.I.P.-Father Baraga, the "Snowshoe Priest", embraced Michigan's snow, as an explorer traveling to the Lake Superior Shore in Michigan's Upper Peninsula during the mid-1800s. We visited this tribute site to Father Baraga a number of years back, but it was fun to revisit the outsized sculpture and shrine paying tribute to the adventurous priest via Kath's story at the Great Lakes Gazette blog. Enjoy Winter in North Dakota, because "The Snow Will be Gone before We Know It"-I wish we'd have more snow in the winters here as I've barely had any time when I could cross-country ski in the park behind my house this year, or any other of a number of recent years. Kylie urges readers of the Horizontal Lines blog to take advantage of the winter weather and shares the story of a recent cross-country trek she took with her mom. Know Nebraska: Lincoln Highway, North Platte to Lodgepole-I've enjoyed driving the Lincoln Highway the length of Indiana, Ohio and West Virginia, as well as through portions of Illinois, and Pennsylvania and learning the history of America's first trans-continental highway. I enjoyed reading about Muriel's travels through Nebraska on the fabled road and hope to make the same drive someday myself. Check it out on the Nebraska Outback blog. Back to my Detroit Area Winter Sunset Spot-It's difficult to see the beauty winter beauty of the Detroit area when we seem to be experiencing what I call six-months-of-November, but Aaron found the sweet sunset spot at Kensington Metro Park and shares this photo essay of the beautiful scene at The Adventures of elATLboy blog. Indianapolis Motor Speedway: Life in the Fast Lane-Been thinking about hometown guy Glen Frey of the Eagle a lot lately in the wake of his recent death, so it somehow seems appropriate to share Deb's story about experiencing "life in the fast lane" at Indianapolis. Take a ride about the racetrack and learn a bit about the famous race, its history and attractions at Indy. Check it out at the Just Short of Crazy blog. 12 Fun Facts You May Not Know about the Midwest-Connie assembles this list of a dozen fun facts that include answers to the questions: Where did the World's Tallest Man call home? Where is the World's largest railroad yard? Where is the largest producer of cranberries in the country? Check it out at the Midwest Wanderer blog. Picture Book Minneapolis-Check out this cool collection of vintage views of Minneapolis at the Nokohaha blog. My favorites here include a view of the Stone Arch Bridge, with the Tenth Avenue Bridge in the foreground, and a beautiful parkway known as Calhoun Boulevard during what looks like it could be from the first decade of the 1900s. Revitalizing Detroit Michigan one Tree at a Time-Deb takes a look at Hantz Farms, an innovative program that seeks to clean up and revitalize some of the most troubled and vacant properties in Detroit. I remember hearing a lot of discussion and resistance to the farm's plan as organizers first proposed ways to make the city more livable, so it was definitely interesting to read Deb's take on the story and see the progress made over the last couple of years. Check it out at the Just Short of Crazy blog. Milwaukee Pubic Market: Exploring Lunch Options-Speaking of growing things, Connie checks out Milwaukee's famed Public Market and the locally produced and grown items available there. This place resembles the West Side Market in Cleveland, Ohio and is definitely on my list of places we want to visit when we finally get to Milwaukee. Read the story at the Midwest Wanderer blog.